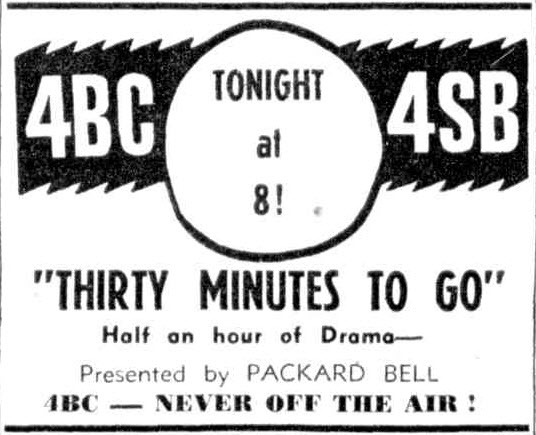 Although 5KA commenced broadcasting this series in April 1953, which from the description in Radio Call newspaper, sounds like 'High Water' at episode 01, there were so few episode titles listed in the run that I couldn't log it. So I have based the dates and order on the 3UZ run listed in The Age Newspaper which did go to the trouble of listing the title. I do have some episode titles which I can add at a later date if further episodes turn up. So far all the surviving episodes I know about have episode numbers taken from the discs and listed here. The numbers fitted the log, except the first 9 episodes. Thanks go to Craig Nugent, Jamie Kelly and Jerry Haendiges who supplied me with titles and episode numbers from their collections. Craig Nugent also supplied further documentation to be included online and in blog. The 3UZ run seems to have finished abruptly and didn't complete the 52 episodes according to The Listener In program guide. 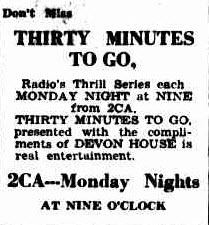 I did however find episode titles in other radio station runs in other states that offer most of the missing titles. Scriptwriters include: Gordon Grimsdale, Don Haring, Roy Ingelby, Kay Keavney, Coral Lansbury, James Workman. Cast Include: Charles 'Bud' Tingwell, Lyndall Barbour as Principal Actors.